Let’s talk about the mini panic attack I had at Costco the other day. Or rather, the three mini panic attacks I had at 3 different Costcos over the past week or so. See, Costco is where I pick up my dates. My big, sweet, juicy, relatively inexpensive dates. And before your mind goes there, I should probably clarify that I’m talking about fruit here, not men. Dates are my everything. Ev.ry.thing. After bananas, they’re easily my favourite thing to snack on, as well as one of my favourite ingredients to use in recipes. Bites, bars, smoothies, [soon-to-be] cookies, and now, coffee creamer… which brings me back to the panic attacks at Costco. 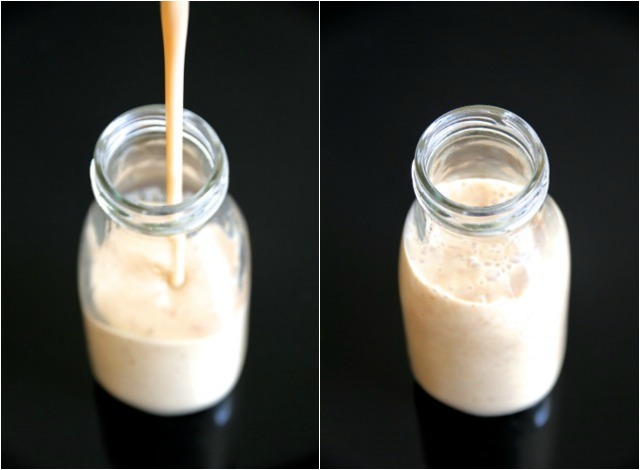 I promised you guys a recipe for my date-sweetened coffee creamer this week, and there I was out of dates. To say that I go through a lot of them is a bit of an understatement, and those suckers can be pricey. Fortunately, I found some good ones at Costco for a pretty decent price. Unfortunately, either everyone in Edmonton suddenly decided they loved dates or the truck carrying them took a wrong turn and ended up in Alaska, because I could.not.find a single tub at any of the three Costcos I went to. I go through phases with my coffee. Sometimes I like it black. Sometimes with some foam. Sometimes with just a splash of almond milk. And sometimes with a splash of something a little more fancy. Coconut milk, water, dates, and vanilla. That’s it. 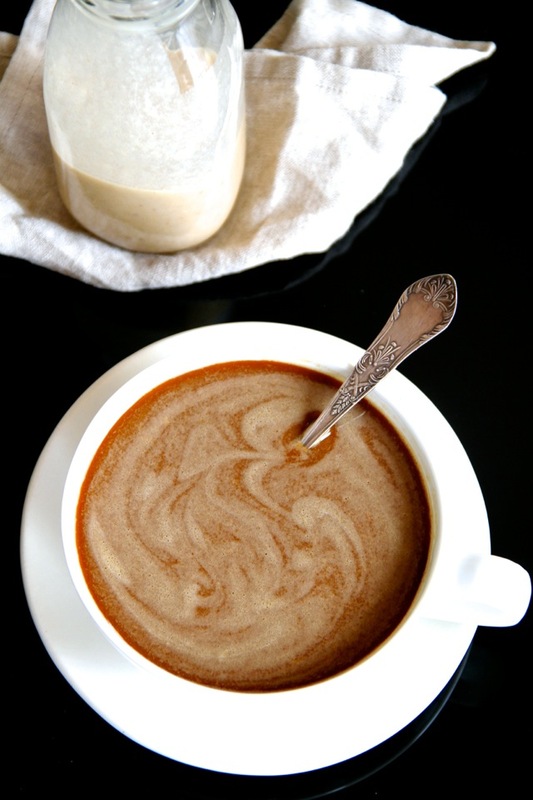 Only 4 ingredients in this ridiculously simple, healthy, and delicious dairy-free coffee creamer. Coconut milk for creaminess, dates for sweetness, and a splash of vanilla for a little extra flavour. Easy, peasy. And the best part is that it really is easy, peasy. 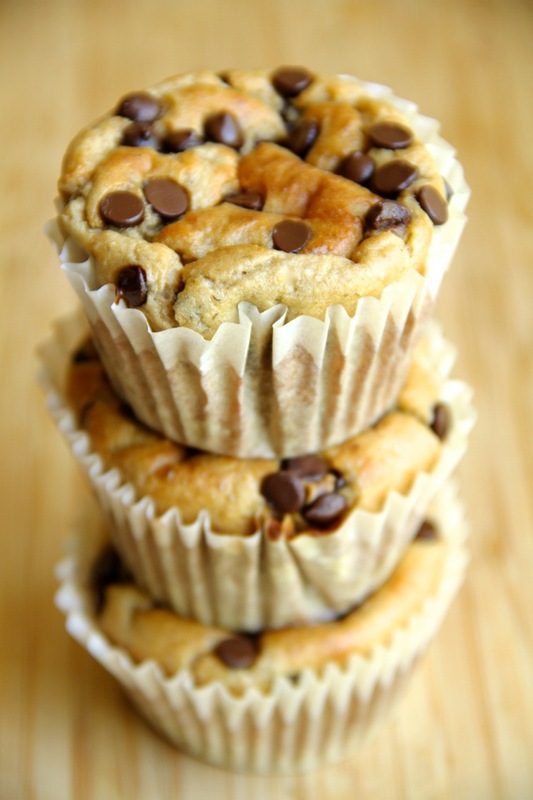 All you have to do is toss all the ingredients in a blender or food processor, and voila! 5 minutes and you’ve got yourself a week’s plus supply of healthy coffee creamer. No, no, wait. Scratch that. The best part is the fact that there’s something magical about the combination of these ingredients that adds the biggest kick to your cup of coffee. I kind of reached the point where my morning cup wasn’t having much of an effect on me anymore, but my morning cup with a splash of this creamer? Boom. I’m flying. Add the dates and hot water to a high-speed blender or food processor. If your dates are a little dry, allow them to soak for 10 - 15 minutes so that they'll be easier to blend. 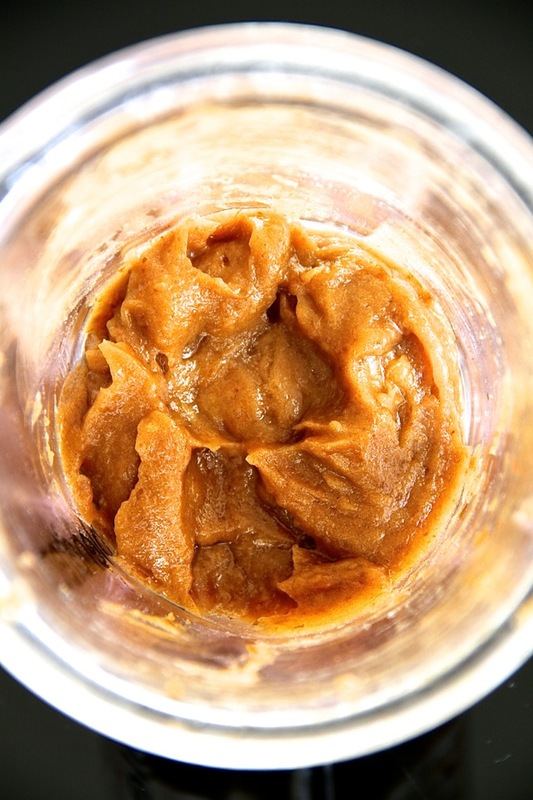 Otherwise, process oh high until the dates have broken down and turned into a smooth paste, scraping down the sides of your blender as necessary. Add the coconut milk and vanilla extract, and continue processing until everything is well combined and the mixture becomes smooth. Transfer to an airtight container. You can run the creamer through a fine mesh strainer to ensure no bigger pieces of dates remain, but it shouldn't be necessary with a high-speed blender. Store in the fridge for up to a week. Creamer will thicken as it sits. * Depending on how creamy you want your creamer, you can replace up to half of the canned coconut milk with a non-dairy milk of your choice. Or, you can sub it out entirely and add 1/4 tsp. of xanthan gum to thicken it up. Looking for a healthy snack to have with your coffee? Try one of these! Do you shop at Costco? What’s one food you go through a lot of? « . thinking out loud #128 . Really? I didn’t know Costco carried dates. 🙂 I’ll have to keep an eye out the next time I go with my mama. We don’t really have coffee creamer much over here but this looks bloody awesome. Is it acceptable to just drink it straight up??! This looks amazing, I love dates also, but there so expensive here in the uk for the good ones anyway! This will be happening tomorrow morning in my house! I’d do it sooner if I didn’t have to rush the kids off to school now. Genius! Yum! I usually buy the terrible-for-you flavored creamers, but I had no idea how easy it was to make your own. I haven’t been to costco in forever, but it stresses me out too. Way too many people and too much stuff everywhere! This looks amazing!! I’ll definitely be using almond milk though, even though I don’t have xantham gum. It works perfect with almond milk too! It doesn’t come out -quite- as creamy, but the sweetness is definitely there. I’ve been wanting to make my own coffee creamer for awhile. I’m so glad you shared this recipe. I’m sorry about the Costco incident. I hope they have more when you back next time! I love dates too, and they’re great for long runs. That’s actually when I first discovered them, was at the Whistler 50 mile ultra! They’re killer. This sounds amazing and I love the fact that it’s dairy free! Oh my word Amanda this looks amazing! we don’t have creamers in the UK – milk is the only thing people put in their coffee – but I want, nay, need this in mine! Oh and I too had that happen to me once, Costco was out of dates! I literally had a tantrum in the middle of the store – yup just like a 3 year old! Costco can definitely be stressful, but it is also one of the BEST bargains around for produce and other healthy staples! I have also been there before…running around to 5 different grocery stores looking for dates. Terrible, terrible. Something not terrible=this creamer and these photos! Love. I love dates (alone, with almond butter, with dark chocolate, etc. ), but I’d never have thought they could be used for coffee creamer! That’s super creative! Oh my gosh, the same thing happened to me a few weeks ago! I couldn’t find dates anywhere and it was driving me nuts! I wonder if there was a date shortage or something. 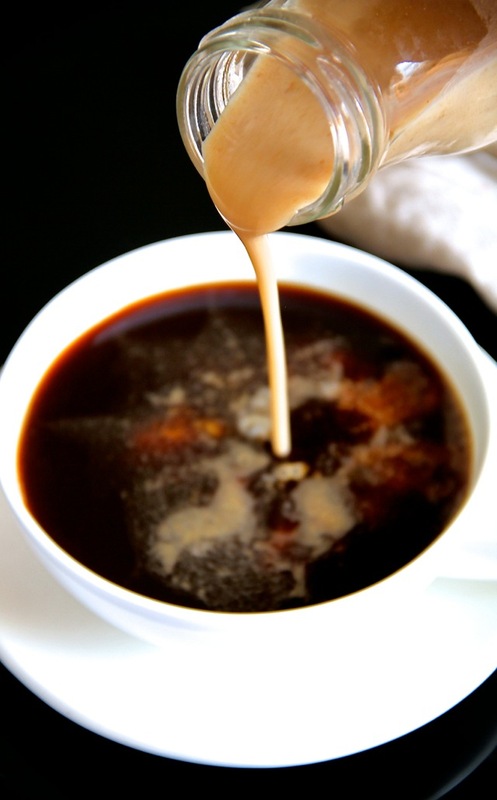 I love them just as much as you do and I think the idea to make a naturally sweetened coffee creamer with them is brilliant! I only like coffee with creamer but most of the flavored options are full of junk so I just nix it altogether. But this could definitely sway me back on the coffee train! Omg please don’t say that. I wouldn’t be able to cope! I’d probably be willing to give up coffee sooner than I’d be willing to give up dates. Just whipped this up with cashew milk! So good!!! 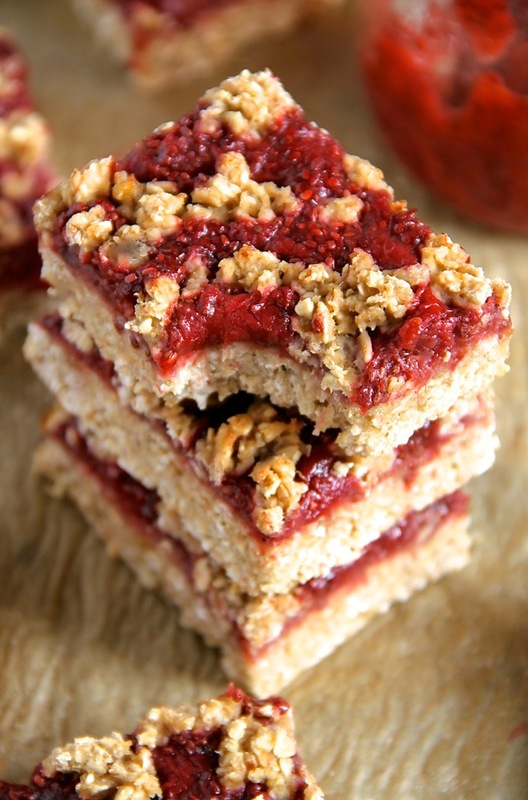 My goal this weekend is to make those muffins and strawberry bars! Maybe the creamer too now. Thank you! I gotta admit – before I read your clarification – my mind DID go THERE! Haha – my daughter is always checking out The Boys when we go to Costco – even though my mind is always on the dates too! Their dates really are so fresh! 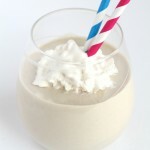 Speaking of fresh – what a fresh idea this is – I am blown away – dates, coconut milk, vanilla and water??? Dang lady – this is just plain BRILLIANT on so many levels! IMO – you should start selling this stuff! I definitely love black coffee, but I tend to splash a little fancy cappuccino from the machine (LOL.. so fancy) before I fill ‘er up. At home, I put my protein powder in it which makes it taste pretty amazing. Cinnamon roll protein powder + pumpkin spice coffee = good combo. I always sneak into Costco to “look around to see if I want to join” if I want a free lunch. LOVE samples. Oh my gosh! I need this coffee creamer in my life NOW! Your site really helped me get thru my gluten free trial! Thank you!! I found dates at COSTCO.COM and had some delivered this week!!! I have been looking for them in the warehouse since late last year. One recent trip to Costco, I accidentally bought figs instead. As a result, I have continued looking for dates so I could make some of your recipes, like this one. I made some of your yummy. 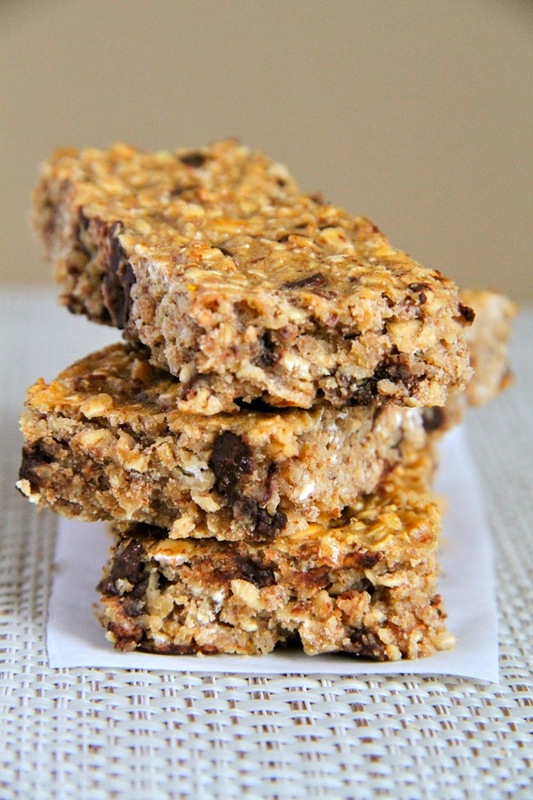 no bake chocolate fig newton bars based on your no bake vegan oatmeal fudge bars recipe. I liked them so much, I plan to make them with the figs again, intentionally this time! lol Anyway, great photos! 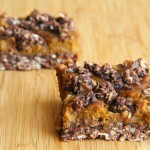 I really like reading your blog and making some of the recipes. Congrats on your personal progress managing your health and food. You are so very pretty! Beautiful coloring with glowing skin! I am back, miss me? lol…I never take over 24 hours off from my computer but I must admit, it was nice even though I was sick. 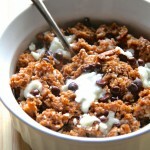 This recipe is awesome and creative- definitely something I would use in place of skim milk. I like my coffee plain with just a drop of skim. I should try this instead. I’ve frequently thought about making my own creamer but never carried through with it. Maybe you’ve inspired me to do that! Haha we will see. It looks really good though. For me personally I go through a lot of store bought coffee creamer and coffee. I haven’t had dates in years but maybe I’ll try them out again. I didn’t even know creamer was a THING until I came over here- Also Persian Dates > costco dates > any dates. Also…I want to drink this by the bottle. Confession: I totally drink this from the bottle. Oh my goodness I cant even tell you how happy and excited I am to try this out. I can’t have soy or dairy because of my son and I LOVE coffee, but plain almond milk never cuts it for Me. Wow, how do you come up with the innovation to create all these recipes? When did you start experimenting? This looks really tasty, even though I don’t drink coffee. Can you drink it straight? I honestly just take ingredients I love and combine them together to see if they work 😆 And you can definitely drink it straight. I do! Costco is my go-to source for dates too. I actually just stocked up on them there. Well, my mom did for me. I don’t have my own membership so I just make her lists of what I need every so often lol. I go through a lot of dates, bananas, oats, and almond butter. Pretty sure you and I are in the same boat there haha. Love the idea for this coffee creamer! I love this post. I love everything about it from the banana to the date love, to the black background in the pictures, and the clean and delicious coffee creamer. This makes me happy. Also, the Hubby picked up a giant bag (they come in bags now!) of dates at Costco. He said he really had to dig to find them too. If not, I would have been panic attacking right there with you. Oh and you easily use up all those liters of maple syrup. No problem. I get my dates at Costco too. They are fantastic! I make cashew milk that I have been using to make lattes recently and I throw some cinnamon and dates in the milk to make it fancy. It makes a fantastic latte…especially with some honey! Dates…who knew….now I need to go find me some and test this out…..
I’m just betting if you subbed almond extract for the vanilla, this would be insanely good on berries. (Even if you didn’t! Just curious if anyone else tried this recipe? I’m wondering if I did it incorrectly, as mine seemed to still come out slightly grainy, and not real sweet (which isn’t a terrible thing). Any suggestions? I used Medjool dates, but you could really use any kind! you for this pleasant experience! 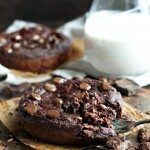 I am excited to make this today, looking forward to a dairy free option. I just wanted to share something I discovered about dates. I am in love with them and bake with them all the time. Some time back I looked up some information on the non organic dates and found that the conventional crops are sprayed with some nasty pesticides and fungicides. So if you can buy organic its better, they cost more about $9 a pound in the US, but keeping them in the fridge in a container helps them stay longer. Of course they will probably get eaten up before they go bad. Thanks again for the recipe. This is genius! I will have to get some dates and try it very soon. Hey! 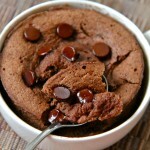 Just came across this recipe and it looks amazing. I’m incredibly guilty of using bad-for-me store-bought creamers. I just have a question. I love flavoured coffee creamers. 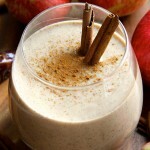 I was wondering if I could add different flavourings to this recipe, like pumpkin spice, cinnamon, or hazelnut? can I use regular coconut milk off the shelf in a half gallon instead of canned? You can, Kamal, it just might not be as creamy since coconut milk in a can tends to have a slightly higher fat content. Have you tried date crystals or date sugar? Both are also great substitutes for sugar! I was so excited to find this. I had almonds and cashews soaking and have tried several recipes for creamer but I just couldn’t find what I was looking for until now. I LOVE the date paste. The sweetness is subtle and not overpowering like many things I have tried, including store bought creamers. Even the organic products end up being too sweet. I am more of tea connoisseur but I am sure this will be great for my occasional cup of coffee. Thanks for sharing! I’m so glad you like it, Pam! I totally agree about store-bought creamers being way too sweet. Thanks for taking the time to leave a comment! Simply amazing creamer! Just made this morning and it’s delish! I will admit I am the one who is addicted to a little bit of coffee with my cream and sugar and I was SUPER skeptical (especially after smelling just the dates and water in my blender). I absolutely love the hazelnut coffeemate liquid creamer, so I figured this was going to be a hard sell. Well not so much, I do tend to like my creamer on the sweet side so I added 2 tsp of sugar in the raw and it’s perfect. Excited to try with additional spices for fall!!!! I read on another blog about how bad the ingredients in liquid creamers are for the body and actually could have contributed to my leaky gut issue, to be honest I would have never figured my creamer was part of the problem. Well it is the one thing I never gave up, so here’s hoping I can finally heal my tummy!!! Thank you for this recipe!! I’m so glad you liked it, April! Giving up our favourite foods is never easy, but it helps if we find things to replace them with. It’s pretty crazy how things we would never even consider can affect us! Yum, I’m going to try this! I shop at Costco and have purchased their dates, but I’ve found a local Indian store and they sell the freshest medjool dates for even less money than Costco!! Eek! Thanks for sharing that, Annie! I’m sure others will find it helpful. A great recipe! I came across your site when searching for Nutpods copycat recipes, as my local stores do not sell that product yet. When I remove the thickened coconut cream from a can of coconut milk for cooking, I use the clear liquid that remains and some of the cream and mix it with date paste and almond milk (as thick as I can make it – homemade almond milk is always thicker and creamer than store-bought). A good use for that leftover coconut liquid and this combination evens out the flavor so it does not taste strongly of coconut or almond. Hi, i tried making this, and after i blended it all together, it was a curdled mess. was the hot water too hot? Hi! I stumbled across this site after googling “non-dairy coffee creamer recipes”. I bought the stuff to try two recipes – this and another. I just made it and put it in my tea. It’s AMAZING. I didn’t even bother trying the other. My stomach doesn’t love dairy, but I work at a coffee shop and couldn’t get through the day without an iced coffee with cream. The texture was necessary for me. This recipe NAILED the texture completely. I can now lead a more dairy free life. Thank you so much for this recipe. Thank you so much for this! I’ve been struggling to find a vegan, no sugar added coffee creamer that actually tastes good and this was way beyond what I had hoped for! Thank you, again! It doesn’t even taste like coconut to me. I love how canned coconut milk so magically does that. I used full fat coconut milk and medjool dates and it is thick, rich and delicious. Not too sweet, just right. I have tried making creamer with coconut milk and dates but it always comes out gritty. Am I doing something wrong? I usually put the dates in boiling water for about a minute but I don’t add the water to the creamer. Thanks!! Yum! Ihave been looking forward to trying this recipe and finally finished up the last of my Coffemate creamer this morning 🙂 I purchased some dates @ my local Albertson’s for around 3.99/ 8 oz, bag, which I believe will make around 2 1/2 batches of this. I used Almondmilk which runs me around 3.99/ 96 oz. So, all in all it’s a little pricier but not by much and definitely worth it. The directions were easy to follow and my Nutri Bullet created a delicious, smooth creamer. Thanks so much for sharing this recipe! This looks so good, can’t wait to try it. Will it froth up? I have been looking for a homemade coffee creamer to replace my store bought coconut coffee mate since I went paleo about 4 months ago. I have tried dozens of recipes, this one nailed it! Just the right amount of coconut to flavor in my coffee with no foreign ingredients I can’t even pronounce. Second time making this creamer and i’m addictive to this. I usually like to drink my cogffe black but somerimes i get tire of it. I dont really like all the ingredients in the creamers from the store so decided to look for something easy and tasty. This is my favorite coffee creamer. Thank you for sharing this recipe. Thank you so much for this recipe! I am new to the whole 30 eating plan so this creamer is a blessing! I will admit you were right about not comparing it to store bought creamers, not as sweet but definitely healthy thanks again!